It’s been a while since I posted about a loaf of bread. I’ve been baking, but not as frequent as I would have liked to. Last few weeks were very hectic. The ultrasound on my yearly checkup of my breasts showed a possible malignant mass, but luckily it was benign. But before we knew this we had some troublesome weeks. The hospital which can deal with this kind of problems is a four hours drive away through the mountains in the north of Thailand. We could only see the doctor in the evening so we had to stay overnight. It took four appointments and one operation before we got the good news that the cyst was benign. So lucky us!!!! During all the waiting for the results I tried to bake some bread; normally it helps me to relax and meditate. But it was hard to concentrate. Now everything is back to normal. And there was a big necessity to bake bread because we ate all the breads out of the freezer. Today I went again for delicious Ciabatta and a Multigrain Norwich Sourdough. 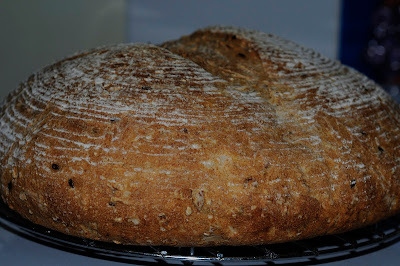 Whenever I want to bake failure-proof bread, I go for Norwich Sourdough. This bread has a delicious crumb with a crunchy crust; the way a good sourdough should be (for us). Since I soak the multigrain they are chewable instead of tooth breaking. And they don’t stick between your teeth. 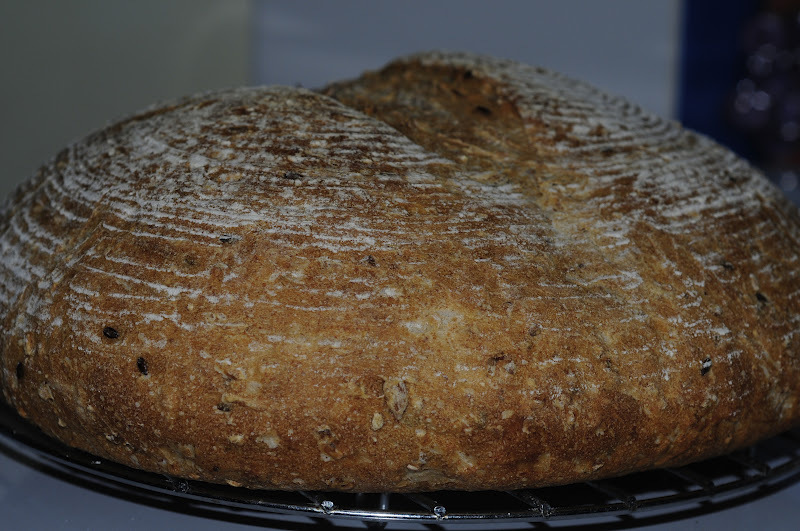 The main reason I choose multigrain is because it tastes great; it gives the bread a nutty flavor. And I also added some delicious sunflower kernels. And of course it's very healthy! I made one big loaf of 900 gr. First I soaked the multigrain and the sunflower kernels in 50 g of boiling water. I like it this way; otherwise the seeds can be teeth breaking. In the bowl of a stand mixer, mix the flours, water and starter on low speed until just combined, about one minute. Add the salt and continue mixing on low or medium speed until the dough reaches a medium level of gluten development. This should only take about 3 or 4 minutes. During the last minute add the soaked seeds. Transfer the dough to a slightly oiled container, cover and ferment at room temperature (22-25°C) for 2.5 hours, with folds at 50 and 100 minutes. Turn the dough out onto a lightly floured counter. Pre-shape the dough into a light ball. Sprinkle the ball lightly with flour, cover loosely with plastic, and let rest for 15 minutes. Shape into a ball and place seam-side-up in a floured banneton. Cover the banneton with a moist towel and at room temperature for 2 – 2,5 hours. I proved for 1.5 hours at room temperature because of the temperature in the house. Meanwhile, preheat the oven, with baking stone, to 250°C. For steam I placed a bread pan with stones. 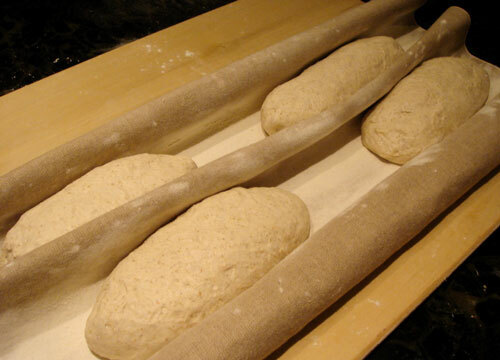 Turn the proofed loaves onto parchment paper on a peel. Boil the water for steaming. Slash the loaf and put it on the baking stone. Once the loaf is in the oven, turn the heat down to 230°C and poor the boiling water on the hot stones. I baked it for 15 minutes with steam, and another 25 minutes without steam. I turn the oven off and left the open ajar. Cool on a wire rack. Don’t cut until the loaves are completely cool, it will be worth the waiting.